Rebecca Canty did an internship with Accessible Arts through the PACE unit "Working with and employing people with a disability". During her internship, Rebecca Canty worked on organising the Arts Activated Conference, the national arts & disability conference. "My PACE unit really allowed me to prepare for the workforce, by giving me work experience and allowing me to turn the theory I had studied at university into a practical and professional environment." "It's been really great to be able to interact with a lot of different people who are really inspiring." At the end of her internship, Rebecca was hired by Accessible Arts to continue doing an administration role on a part-time basis. "It's a great program... I think the experience that Rebecca had here will really prepare her for the workplace." "We've had a good experience. Rebecca has been great. She has been able to learn very quickly, and she's applied herself, been diligent, and been really keen to learn." 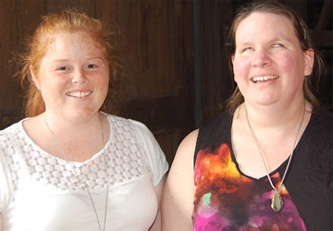 "I would say to any organisation, if they get a student like Rebecca, I would recommend the program." - Sancha Donald, CEO of Accessible Arts. Last Updated: 2014-04-24 15:49:40 by Drew Nixon.